Who doesn’t like monkey bread?? Made with a sourdough sweet dough, filled with brown sugar & ground cinnamon, your choice raisins, chocolate chips or nuts and drizzled with a vanilla glaze, what’s not to like!! 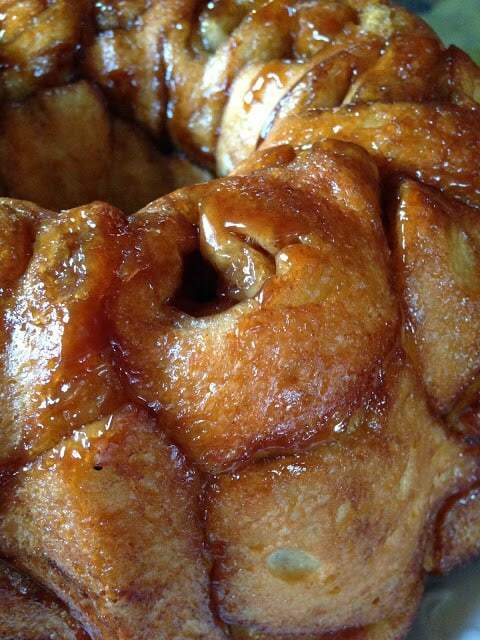 Sourdough Monkey Bread is wonderfully delicious. Monkey Bread is a sweet yeast bread formed by arranging small clumps of dough, which are dipped into melted butter first. Then stacked in 3 or 4 overlapping layers in a pan. The pan can be round, oblong or tube shape. After baking, the clumps cling together to form a solid piece. Monkey bread can be sweet and flavored with raisins, nuts, cinnamon and sugar or savory often made with grated cheese. In a large bowl, stir together starter, water and 1-1/2 cups of the flour. Cover loosely and leave at room temperature to proof at least 8 hours or overnight. When starter has proofed, mix the oil, sugar and eggs in a small bowl; add to the starter mixture. Stir in remaining 1-1/2 cups flour, salt, baking soda, and baking powder. Turn dough out onto a floured board and knead 5 to 8 minutes, or until smooth. Cover loosely and let rest about 10 minutes. Roll out dough into a rectangle approximately 8 x 18. Brush entire surface with half of the melted butter. In a small bowl, mix filling ingredients; sprinkle evenly over dough. Roll up along the 18″ side, forming a log. Using a sharp knife dipped in flour, cut the roll into 24 pieces, then form into balls. Dip balls into remaining melted butter and place into a lightly greased bundt pan, stacking one on top of each other. Set in a warm place and let rise until doubled, 1 to 2 hours. Bake at 375º for about 30 to 40 minutes. Remove from oven and flip pan upside down on serving plate. Mix together icing ingredients until desired drizzle consistency. Drizzle icing over warm Monkey Bread. Sourdough Zucchini Nut Bread is another recipe in A Week of Sourdough Recipes. I'm making this today! Its in the oven. 15 more grueling minutes to wait! 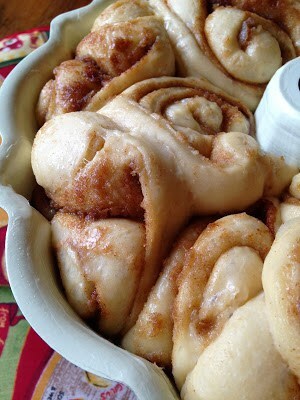 Oh my gosh, how genius to make mini-cinnamon rolls as your "dough balls" for your monkey bread. It looks gorgeous and I bet it tasted amazing! Great job! It looks so yummy indeed! Love the fact that it's made with cinnamon rolls instead of just balls. Soft and fluffy cinnamon roll monkey bread. Sounds a winner to me! Beautiful! Looks like a fantastic book, and quite a product! Beautiful! 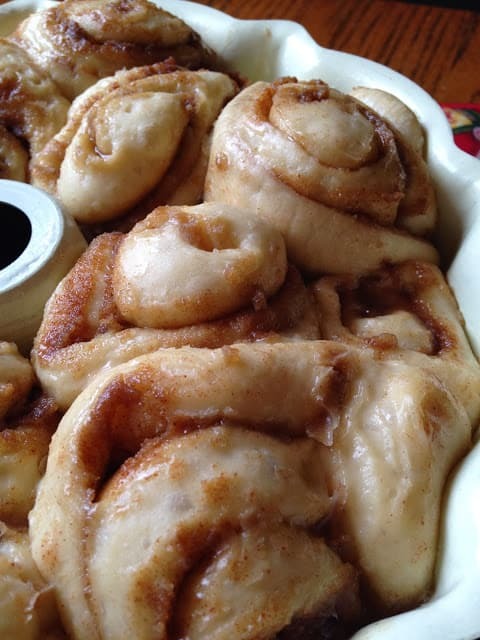 Love all those twists and swirls from the cinnamon rolls. Delicious! Oh, I love your filling! All the good things rolled up in fluffy dough! That looks amazing! 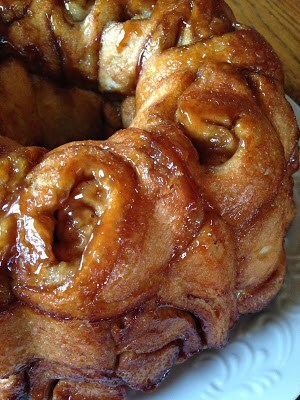 I've never made monkey bread, but I'm going to have to try! What an awesome idea for sourdough starter. Never would have thought of this! Pinning! I was a little skeptical too, but this turned out fantastic! Lovely combination of gooey outside and fluffy crumb on the inside: impressive! This looks so good. Wow. I made my bread back in January and I think I may need to make another after going through everyone's posts today. I forgot how much I love monkey until I made this one….could be dangerous! Love how this looks! Oh so gooey. And the inside looks perfectly cooked!